Witjuti Grub Bushfood Nursery is owned and managed by Veronica Cougan. 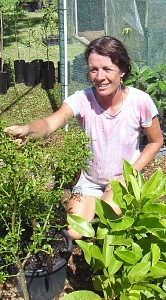 The Nursery was established in 1996 by Veronica and Graeme White, specialising in quality native bushfood plants for the home gardener and commercial grower. There are about 250,000 species of flowering plants in the world. Given this biodiversity it is perhaps surprising that, with 10,000 years of settled agriculture, only about 100 species have been cultivated as significant food plants and only about 20 constitute the staple foods of the developed and developing world. It is estimated there were upwards of 5000 different bushfood plant species across Australia utilised and harvested seasonally by Aboriginal people. For centuries 'bushfood' plants have been an integral part of our indigenous people's staple diet and lifestyle. Today these native foods are being rediscovered by contemporary Australians and used in ways as varied as our multi-cultured backgrounds. With over 20 years experience in the Native Bushfood industry, we at Witjuti Grub, can offer a wide selection of subtropical native food plants that have been selected for their superior fruiting and leaf qualities, to suit your requirements. We also have a Consultancy service to advise you with your plant selection and guide you through the planning and planting of your Bushfood garden, commercial orchard. As our awareness and appreciation for our Indigenous heritage grows, many progressive schools are establishing Cultural native food gardens as part of their Indigenous studies programs. Our Consultancy service, as well as providing advice on planning and plant selection, we will liaise closely with your local Indigenous elders. We also have a comprehensive range of plant profiles, with photo, available as teaching aids.